The Logitech Keyboard Case by ZAGG, originally created for the iPad 2, covers only the front of the tablet when it's closed. The slight increase in thickness of the third-generation iPad is therefore no problem, and the designers didn't need to redo this keyboard cover ($99 as of May 11, 2012) to accommodate Apple's latest slate. However, while the aluminum frame provides solid protection for the front, the case leaves the tablet's back fully exposed. At least it matches the aluminum back of the iPad for a seamless look. Rubber pieces at each corner, and in a strip behind the keyboard, hold the screen off the keys to protect it when closed. The same padding runs around the inner edge of the case to hold the outside edges of the iPad. Nothing clips or locks into place, but the iPad stays in securely as long as you make sure to press all of the edges down. The slot behind the keyboard also props the iPad up securely, in either portrait or landscape mode. 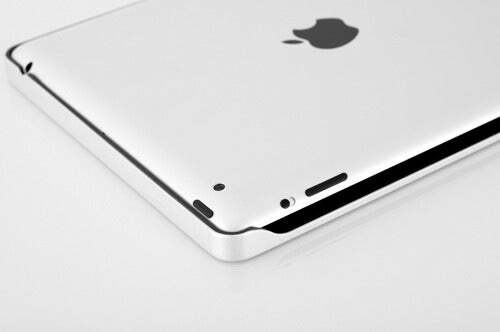 The slot holds the iPad at only one angle, but luckily it's a good one. Behind the slot are the on/off switch and connect button, along with LEDs to indicate status and charging. The outside of the textured aluminum case accommodates the Micro-USB charging port on the back right side. The high lip around the keys can get in the way sometimes. 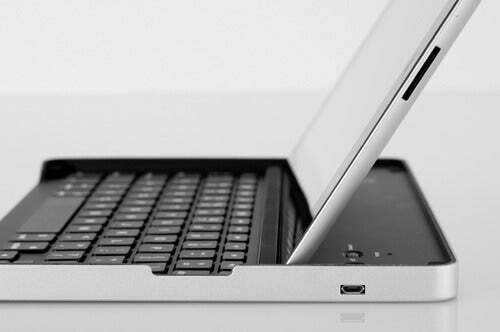 Due to the way the case is designed to grip the outside edges of the iPad, there is a high lip around the keyboard that dips only in the center front to stay out of the way of your wrists. It works for the most part, but at times I bumped the corners of the lip with the edges of my hands if I let them drop too low, which I tended to do when I tried to use the keyboard on my lap. Surprisingly, the thin little trench that the iPad slots into was secure enough to hold the iPad in place while I used the keyboard on my lap in landscape mode, but it was too top-heavy in portrait mode. I regret to say that the typing experience doesn't match the quality of the rest of the case. The middle of the keyboard deck has a little flex, which seems to contribute to the spongy feel of the keys. Size, spacing, and key travel are all fine, but I can't get past the mushy feedback. And even though I bumped into the edges only when I used the keyboard on my lap, I can't shake the claustrophobic feel of having walls on the sides of the keyboard. The keyboard does offer lots of helpful iPad shortcut keys along the top row, such as home and search shortcuts, an on-screen keyboard toggle, cut/copy/paste buttons, media playback controls, volume controls, and a lock key. The cover leaves the back of the iPad exposed. The perfectionist in me likes to make sure that the shiny Apple logo on the back of my iPad remains scratch-free, so I'm not too keen on the idea of leaving the back unprotected. That, combined with the mushy keys, would leave me looking elsewhere for a case. But if you're seeking a sturdy protection for the display, and if you can tolerate a mixed typing experience, you can't beat the aluminum frame of the Logitech Keyboard Case by ZAGG. The Logitech Keyboard Case by ZAGG provides excellent protection for the front of the iPad and holds the tablet at a good typing angle, but it leaves the back unprotected during transport, and the keys don't feel as nice as on other keyboards.